Please note that information is only accurate at time of posting, so please note date of posting, and check for updates accordingly. Maybe it’s beginner’s luck, but my first marshrutka (shared minivan) ride went very well! Tripadvisor actually has several reports of crappy vehicles, crappy drivers, waiting forever for the van to fill, but none of that happened to me. First off, there are several bus stations for marshrutkas going from Tbilisi to Yerevan. From my understanding, there are three, one from the Tbilisi Railway Station, one from Ortachala (the most popular, apparently), and one from Avlabari metro station. I chose the last option, because it’s convenient by metro, and more recent reports suggest that you get better vehicles, and there’s supposedly a timetable of sorts. Based on a supposed timetable by someone on Tripadvisor, I aimed to go for the 11 am departure. I arrived at Avlabari station at 10.50 am. Following the excellent directions from another traveler on Tripadvisor, I located the marshrutkas easily. Where are the Marshrutkas in Avlabari? When you come to the top of the escalators, take the left door. Once you exit the door, look to the right. There is a parking lot with several mashrutkas. On the day I was there, they were all heading to Yerevan. 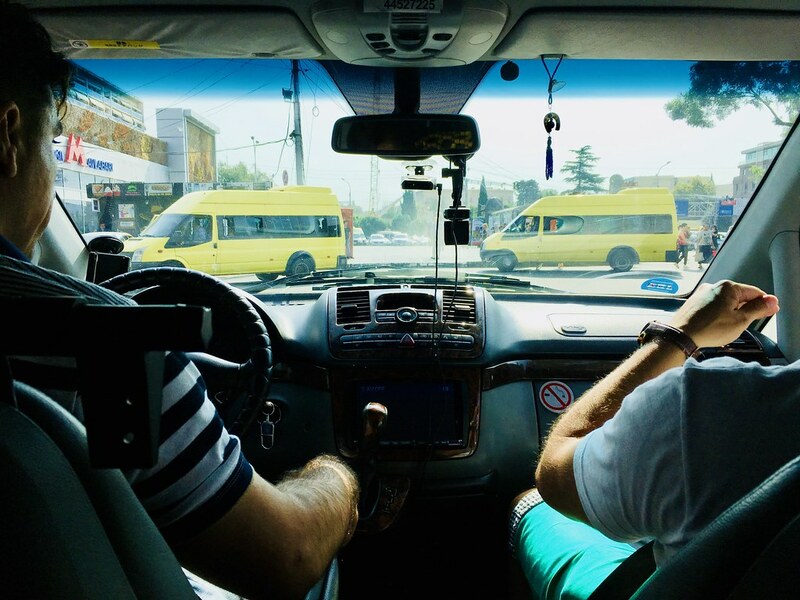 Despite comments suggesting that English isn’t used, the marshrutkas had the English word “Yerevan” written on the signs displayed on their dashboard. Once I got there, I approached a gentleman holding a notebook. I said “Yerevan”, he asked if I had reservations (so, you can make reservations!). I said no, after which he directed me to one of the marshrutkas. I was the second last person on that marshrutka. He filled the last spot in less than 2 mins, and we were off before 11 am. 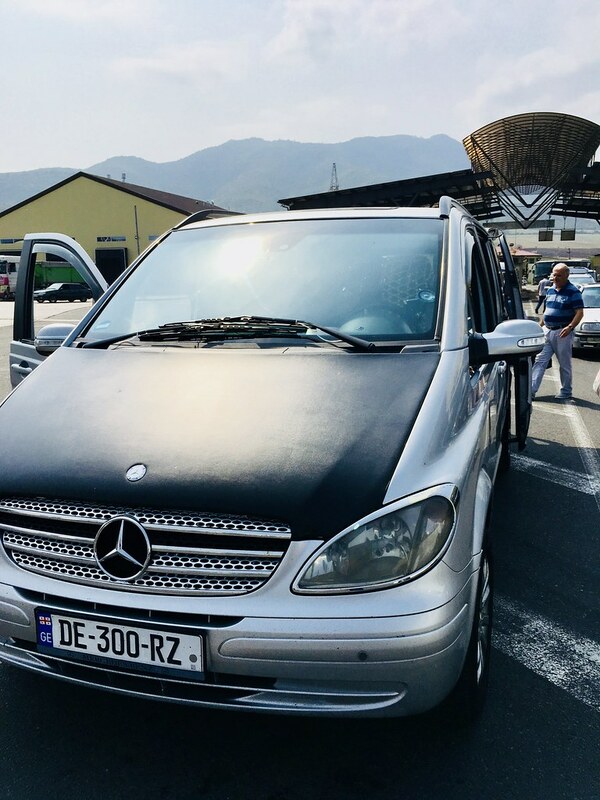 The marshrutka I got on was a new Mercedes Vito seating 7. It also seems to have a functioning wifi, as advertised – I say “seem” because I didn’t try it myself, but the guy in front seemed to have used it with no problems. I was in the front row, middle seat. Even though I was in the middle seat, it was actually very roomy. I didn’t feel cramped or uncomfortable throughout the trip. I did have to buckle up, because the driver occasionally jammed his brakes, and the seatbelt prevented me from flying forward. This was easy peasy. The Georgian side didn’t take took long to check me out of their country. We then hopped back on the marshrutka, and he drove a short distance over to the Armenian side. The Armenian side took slightly longer. Be prepared with address/proof of your accommodation in Armenia. It’s not a super strict requirement. The immigration officer just read the address off a third party app on my phone. He also scanned in my Azerbaijiani visas without comments. For the border crossing, either remember the people in your marshrutka, your driver, or take a picture of your marshrutka. There are several similar-looking vehicles heading in the same direction. I’d say the whole border crossing took under 30 mins. I changed the last of my GEL into Armenian drams at the exchange after the Georgian border. Rates were ~10% worse than market rates, but whatever. We stopped for a short rest on the Armenian side of the border. And about 1 hr after the first stop, we stopped for another break, and also for the driver to fuel up. He dropped several people off en route on request. We finally pulled into Kilikia Bus Station in Yerevan at around 3pm. Quite frankly, I was expecting the worst after reading all those reports about marshrutka travel. It did not reflect my experience. I had pleasant ride in a new vehicle and a decent driver. I didn’t stumble out of the marshrutka thinking to myself “never again”, so yay!